After two years the Burundi crisis continues to worsen. Despite government claims that the situation has normalized, facts on the ground suggest otherwise. Click on image for printable PDF version. Two years after Pierre Nkurunziza announced his intention to pursue a contested third term as President, the Burundi crisis continues to worsen. Despite claims by the government that the situation has normalized, facts on the ground suggest otherwise. 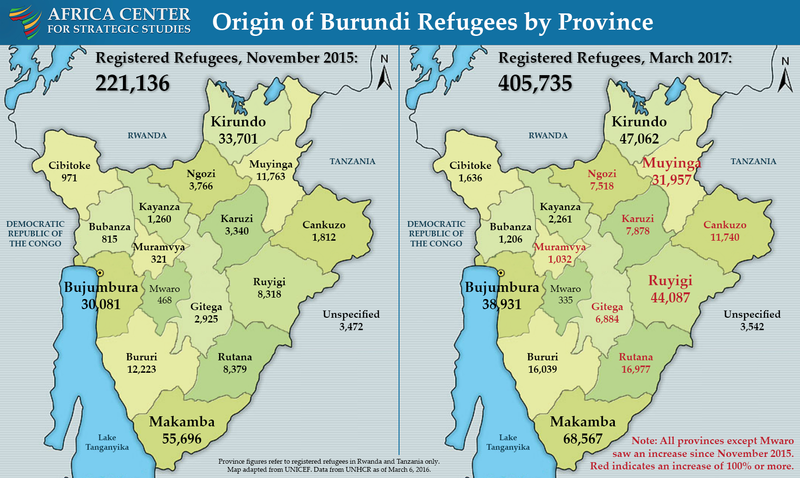 The number of registered refugees flowing out of Burundi has doubled in the past 18 months, including 100,000 new refugees in the past six months alone. 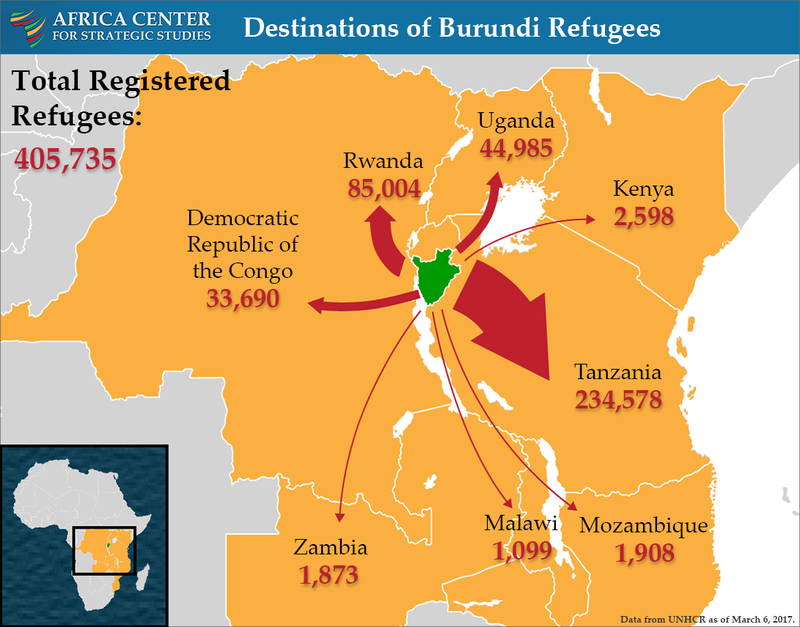 Nearly all regions in Burundi continue to experience high levels of displacement. This mirrors reports of increased violence throughout the country. 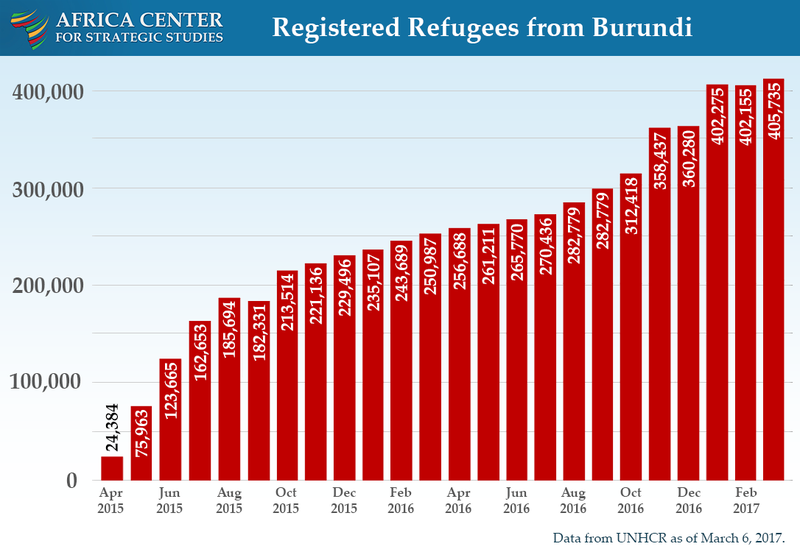 The greatest increases in refugee flows have been in Burundi’s eastern provinces. This corresponds with increased activity (including patrols, roadblocks, recruiting, and attacks) by the Imbonerakure militia in provinces along the Tanzanian border. Tanzania is the largest recipient of registered refugees of any of the neighboring countries. The vast majority of these refugees are Hutu, often seen as the government’s core constituency, underscoring the multiethnic nature of the opposition to the ruling party. While Burundi is a small country, its unresolved political crisis creates significant ongoing costs and tensions for the entire Great Lakes region. Click on an image for a printable PDF version.